1570a, Used Rims,15X6, 5 LUG, 5, 1/2", 3-5/8" CENTER HOLE, 75-91, FORD, VAN, CONV. CAB, TRUCK, 100 , 150, B, 100 , 150, BRONCO, SILVER, STEEL 4 SLOT. 1570a, Used Rims,15X6, 5 LUG, 5, 1/2", 3-5/8" CENTER HOLE, 75-91, FORD, VAN, CONV. CAB, TRUCK, 100 , 150, BRONCO, SILVER, STEEL 4 SLOT. SILVER, A=SILVER B= BLACK. 2038, Used Rims, 15X6, 6 LUG, 4-1/2", 91-02, DODGE, DAKOTA, 4 SLOT, STEEL. 2052, Used Rims, 14X5-1/2, 4 LUG, 100MM, 95-96, DODGE, NEON, 4 SLOT, BLACK STEEL. 3023, Used Rims, 15x6-1/2, 5 LUG, 4-1/2, 92-97, Ford, Mercury, CROWN VICTORIA, GRAND MARQUIS, 4 SLOT, BLACK STEEL. 3036, Used Rims,16X6, 8 LUG, 6-1/2", 84-97, FORD, F350, E350, VAN, DRW, 4X2, 4 SLOT, STEEL. MAY NEED TWO-PIECE LUG NUTS, MAY HAVE ALIGNMENT PIN. 3036, Used Rims, 16X6, 8 LUG, 6-1/2", 84-97, FORD, F350, E350, VAN, DRW, 4X2, 4 SLOT, STEEL. MAY NEED TWO-PIECE LUG NUTS, MAY HAVE ALIGNMENT PIN. 3037, Used Rims, 16X6, 8 LUG, 6-1/2", 85-97, FORD, F350, DRW, 4X4, 4 SLOT, STEEL. 3037, Used Rims, 16X6, 8 LUG, 6-1/2", 85-97, FORD, F350, DRW, 4X4, 4 SLOT, STEEL..
436, HUBCAP USED, 13", 82, DODGE, PLYMOUTH, OMNI, HORIZON, POLISHED OUTER RING, MACHINED FACE, 4 SLOT TYPE. NO LOGO, METAL CLIPS. 8003a, Used Rims, 15X7, 5 LUG, 5", 91-92, BUICK, OLDS, CAD, CHEVY, PASS, ROADMASTER, BLACK STEEL 4 SLOT. 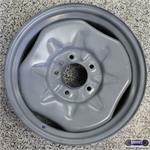 937a, Used Rims, 15X6, 5 LUG, 5", 85-99, CHEV, GMC, ASTRO, SAFARI, STEEL 4 SLOTS. C WILL FIT A. 937b, Used Rims, 15X6, 5 LUG, 5", 77-90, CADILLAC, BUICK, OLDSMOBILE, BROUGHAM, CUSTOM CRUISER, DEVILLE, EIGHTY EIGHT, ELECTRA, FLEETWOOD, 4 SLOT, STANDARD DUTY STEEL. A=W/CENTER CAP B=W/O CENTER CAP C=HEAVY DUTY, BUT FITS A & B. 942, Used Rims, 15x6, 6 LUG, 5-1/2, 73-91, GMC, CHEVY, TRUCK, Jimmy, BLAZER, SUBURBAN, 4 SLOT STEEL. 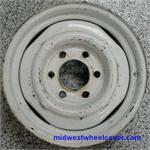 950b, Used Rims, 15x7, 5 LUG, 4-3/4", '70-90, GM, PONT, OLDS, Various. 4 SLOTS BLACK STEEL. A=ARGENT B=BLACK ious. 4 SLOTS BLACK STEEL.